(CNSNews.com) - The United States added 196,000 jobs in manufacturing in 2017, according to data released today by the Bureau of Labor Statistics. In December 2016, there were 12,343,000 people employed in manufacturing in this country, according to BLS. By December 2017 that had risen to 12,359,000. That represents a dramatic swing from the year before. In 2016, according to the historical data published by BLS, the United States lost 16,000 jobs. In December 2015, according to the data, there were 12,359,000 people employed in manufacturing in the United States. That dropped to 12,343,000 in December 2016. “In December, manufacturing employment rose by 25,000, largely reflecting a gain in durable goods industries (+21,000),” BLS said in its release on the December jobs numbers. 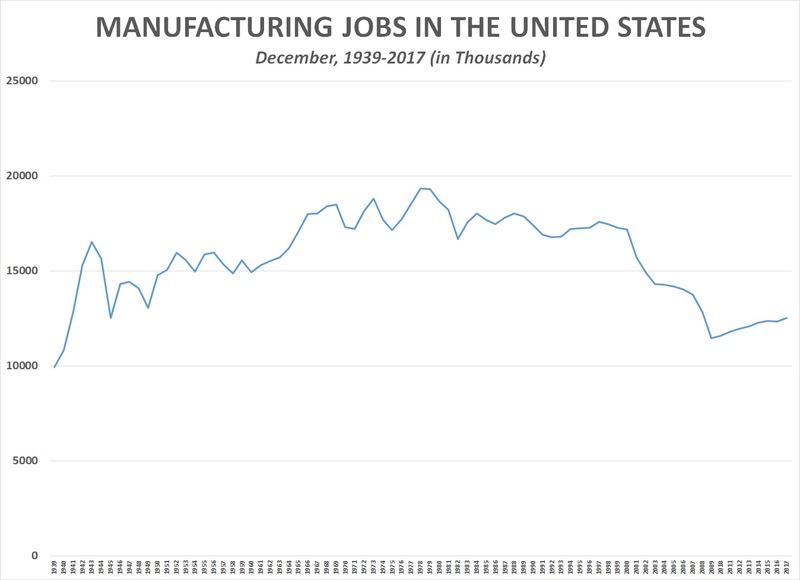 “Manufacturing added 196,000 jobs in 2017, following little net change in 2016 (-16,000),” said the release.